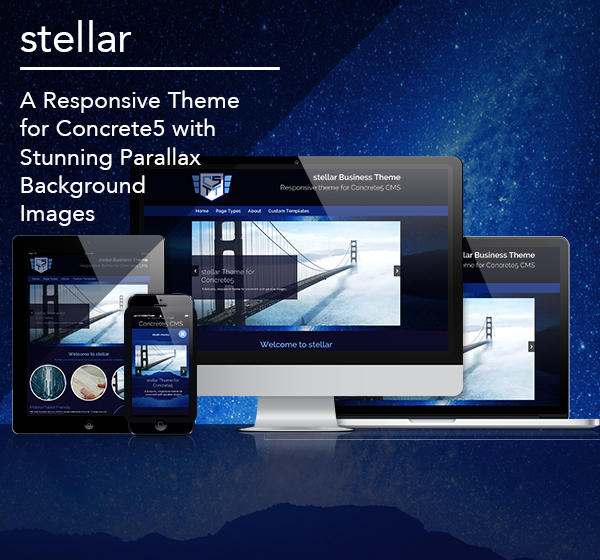 Why choose Stellar Parallax Responsive from C5 Theme Team? Clean, modern and contemporary, this theme is perfect for business or corporate sites. Using a modern colour pallet, clean typography and large parallax image backgrounds, Stellar has been designed to be the perfect concrete5 theme for business or corporate websites. With Stellar Parallax Responsive there's no need for a separate mobile version of your site - it's design scales and adjusts to look good in any browser or device. This is a responsive theme for Concrete5 built on a custom version of the Skeleton Framework. Skeleton is a framework based on a twelve column grid. When a grid column is not used, it simply disappears and does not effect the layout of the page. Developing additional page templates is simple using Concrete5's layouts. Stellar Responsive is built using CSS3 loveliness with a bit of jquery thrown in. Because of this, it won't look as brilliant in older browsers. We have included custom templates to restyle the default image block with a white border & drop shadow, and one to make square images round. Many areas in this theme enable you to create Layouts to build your own grids & custom layouts. Adapt this already versatile theme to suit your website's needs even more. We have enabled CSS3 only Parallax effects on this theme to allow you to create beautiful image panels to highlight information. These are fully customiseable through the editor.